Venus’ global hypsometry (variations in surface elevation relative to a mean) is unimodal, unlike the Earth’s. The study of the cumulative hypsometric curve for both planets reveals that there exists a domain of elevation for which the relationship between the elevation and the square root of cumulative area percentage is linear. 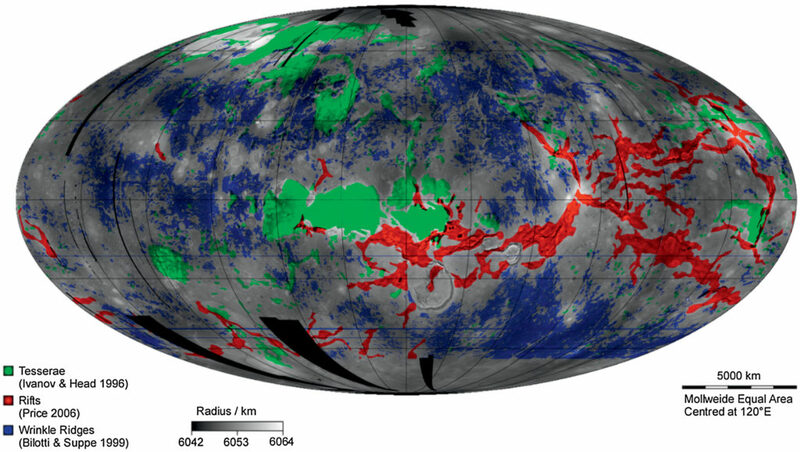 This domain covers about 80% of the mapped venusian surface and nearly all the terrestrial oceanic surface (55% of the earth’s surface) and corresponds to an elevation range of about 2000 m for both planets. It places an upper bound at 90 +/- 10 km for the modal thermal lithospheric thickness of Venus, similar to the Earth’s oceanic lithosphere. 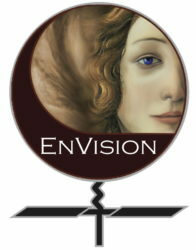 The low-excentricity, near-polar and relatively low altitude (220-400 km) orbit of EnVision offers the opportunity to obtain a high-resolved gravity field at each longitude and latitude of the Venusian globe. The analysis of the gravity field together with the topography gives insights on the lithospheric and crustal structure, allowing to better understand Venus’ geological evolution. About 70 % of Venus topography lies near the global mean average, consisting variously of smooth, gently undulating or ridged terrain. There is a huge variety of features found on these plains – from volcanic features (see-sides domes etc), tectonic features (e.g. wrinkle ridges etc), evidence of flows (canali), aeolian features (dune fields, parabolae). Are canali or other specific magmatic features confined to a past regime or still active today? Is there a correlation between mesospheric SO2 concentration and volcanic activity? Are crater floors effusively infilled and buried from below? Were the plains formed from a few massive outpourings in a short period of time or from many thousands of small flows over their entire history? Or were they formed, or modified, in an entirely different way? 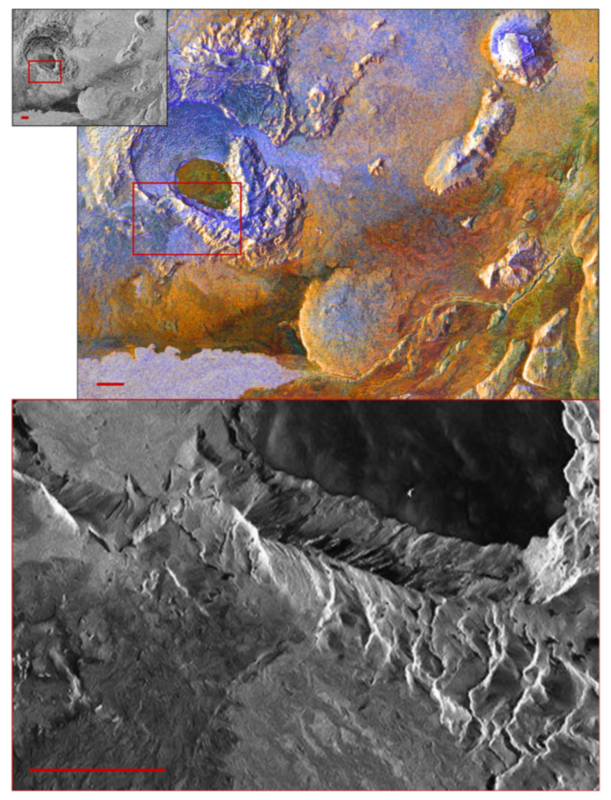 Simulated VenSAR image products from Holuhraun, Iceland. Top Left: Simulated Magellan 110 m resolution SAR image (derived from Sentinel 1a data). Notice low contrast from 2-bit BAQ compression and foreshortening due to lack of appropriate DEM. Upper Right: Simulated 30 m resolution HHVHVV StereoPolSAR image (derived from Sentinel 1a data). Note the new lava flow in blue at lower left. Bottom: Simulated 6 m resolution HiRes image (derived from TerraSAR-X data). Scale bar in all images is 2 km. The surface of Venus is not organised into large plates like Earth’s oceans but it is partitioned into areas of low strain bounded by narrow margins of high strain, analogous to continental basins and microplates. Are these regions actively created and destroyed, like Earth’s oceans, or simply mobilised locally? What is the significance of the global network of elevated rift systems, similar in extent to mid-ocean ridges but very different in appearance? 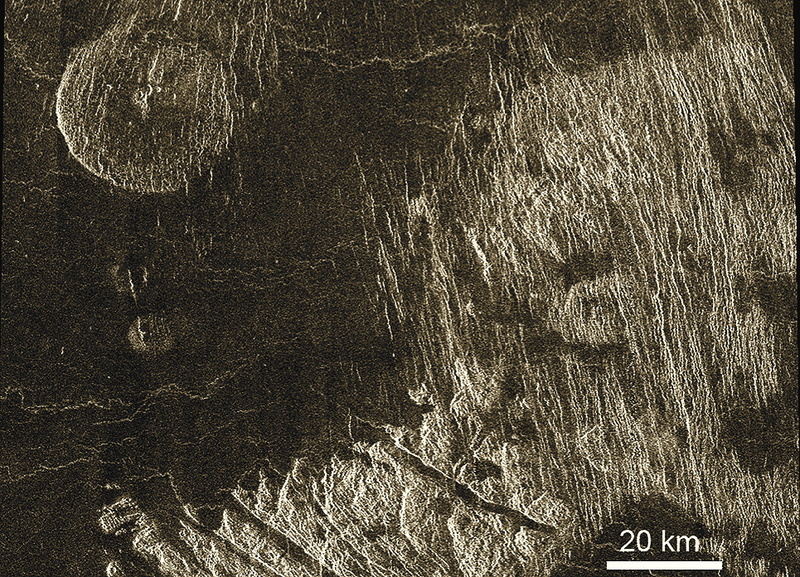 Unique to Venus are coronae, quasi-circular tectonic features, typically 100–500 km across, with a range of associated volcanic features. Are coronae the surface expression of plumes or magmatic intrusions? What role do they play in global tectonic and volcanic change? Volcanic and Tectonic Features (after Ghail et al. 2018). Rifts follow topographic rises along great circle arcs, similar to Earth’s mid-ocean ridges; wrinkle ridges are predominantly in the lowlands. Tesserae are highly deformed terrain across a range of elevations, and are possibly continental crust. Impact craters give absolute age of some surfaces, but too few can be seen to allow dating constraints on different geological units. 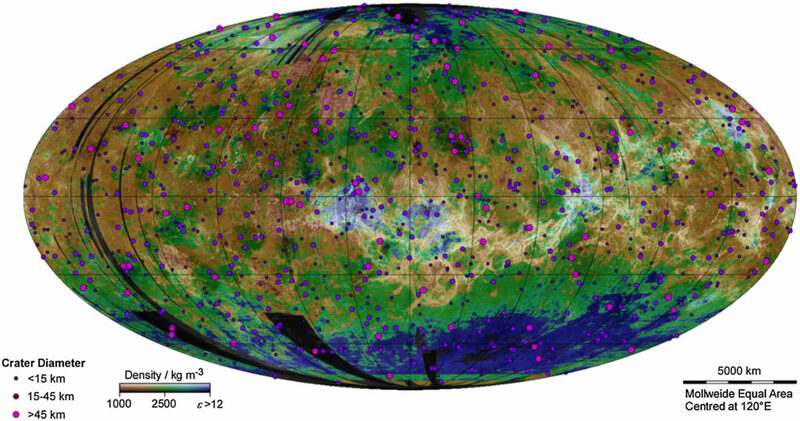 On Venus, the spatial distribution of impact craters cannot be distinguished from a completely spatially random population. This indicates a relatively young surface (less than 600-800Ma). There are open questions about buried features and the nature of volcanic resurfacing. It could have occurred steadily or experienced catastrophic episodes. A debate still exists between “directional” and “non-directional” models. Mapping impact craters and their geological alteration processes will allow to construct a global chronology of the surface that is currently missing. Global Crater Distribution (after Ghail et al. 2018). That the spatial distribution of impact craters is indistinguishable from a random is a puzzle because no other features on Venus occur at random. Underlying colour map shows surface materials: pink − loose sediment; brown − sedimentary or weathered rock; green − volcanic rock; blue − low permittivity materials. Representing about 10 % of the Venus surface, tesserae may represent the oldest terrain on Venus. The processes which have shaped them are unknown. They have never been visited by any lander, so their composition is unknown. They might be either felsic (formed in a water-rich environment) or mafic rock types. Detailed morphology and their tectonic features, coupled with characterisation of surface emissivity and subsurface features, will provide an extensive investigation of these regions. Densely fractured plains (image right, cut by NNW set of faults) embaying tessera (bottom, cut by multiple sets of faults) indicating that emplacement of the material of the densely fractured plains postdated formation of tessera terrain. Both densely fractured plains and tessera are embayed by even younger regional plains (dark areas). A steep-sided volcanic dome is seen in the upper left. Its age relations with the surrounding regional plains are not known. Portion of Magellan image centered at 46N, 360E. After Basilevsky and McGill (2007), Surface evolution of Venus, in Exploring Venus as a Terrestrial Planet, Geophysical Monograph Series 176, edited by L. W. Esposito, E. R. Stofan and T. E. Cravens, pp. 23-43, American Geophysical Union, Washington, DC. Given its similar size and bulk composition as Earth, Venus is expected to be volcanically and tectonically active today (unlike Mars, which, being only a tenth of Earth’s mass, has lost more of its internal heat). Steep slopes and landslides are common on Venus’ surface geology, implying active uplift, but existing data provide no constraint on current rates of tectonic activity. Comparaison of gravity mapping and topography have revealed some regions which appear to be at higher elevation than would be the case if the mantle were stagnant, implying that they lie atop magmatic upwelling. There are regions where volcanic activity is particularly likely to occur. 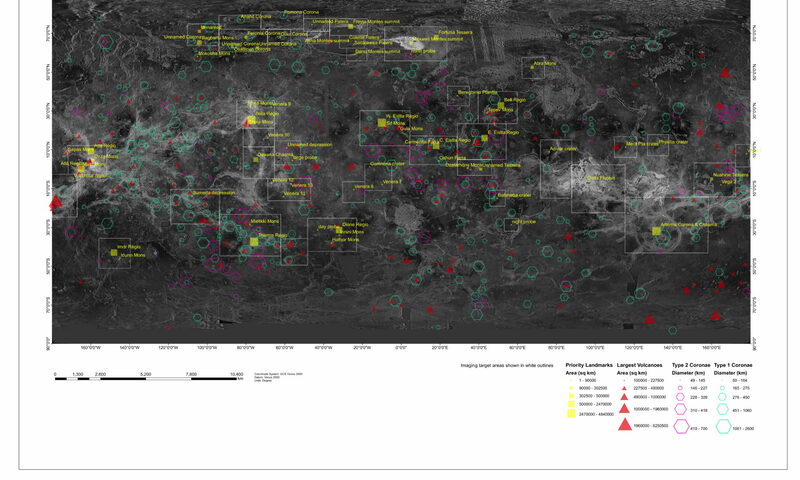 Sites of potential volcanism identified in Venus Express data were in these locations. Therefore the observation and characterisation of these regions are of high priority. l. : Idunn Mons (46 S; 146 W) in Imdr Regio, with its steep-sided dome at the summit, as well as lava flows extending in the surrounding plain, is characterised with high emissivity measurements pointing to recent volcanism; r. : a volcanic shield field inside a corona structure, surrounded by a set of younger lava plains. Change – Is Venus geologically active today? How? Surface – What is Venus’ geological history? Atmosphere – How is Venus’ atmosphere linked to geological activity? Planetary Interior – What happens inside Venus? Spectrometry of different surface units is critical for understanding their composition. Although the optically thick Venus atmosphere precludes this at most wavelengths,there are five spectral windows between 0.8 and 1.2 μm at which thermal emission fromthe surface escapes to space. Surface emissivity at these wavelengths encodes crucial information about mineralogical characteristics like Fe content. Emissivity mapping using these wavelengths, helps to test theories of surface composition, for example about whether the tessera highlands are composed of felsic materials akin to Earth’s granitic continental crust. The internal properties of Venus. Venus is less dense than expected if it had similar Earth’s bulk composition. In order to assess information on its interior structure, it is crucial to determine the k2 Love number and the moment of inertia. The tidal Love number, estimated from Doppler tracking of Magellan and Pioneer Venus Orbiter spacecraft data, is not accurate enough to constrain the state and size of the core, the mantle composition and viscosity. 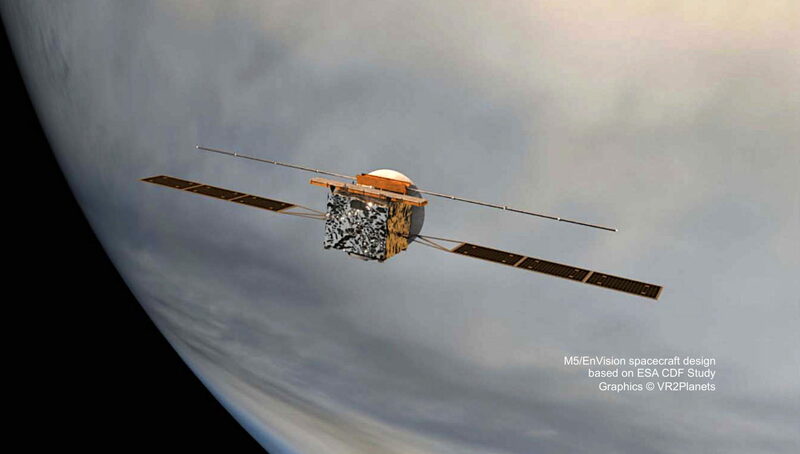 EnVision shall map the gravity field for at least 50% of the surface with spatial resolution of better than 200 km, that is equivalent to the knowledge of spherical harmonics to at least degree of 90 and accuracy of at least 10 mGal/km. EnVision will also measure the k2 Love number of the planet with an accuracy better than ±0.01 –compared to its current knowledge to ±0.066 uncertainty – allowing to constrain the size and state of Venus’ core and the composition of Venus’ mantle.